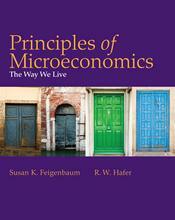 Feigenbaum and Hafer’s innovative text is based on the idea that economics is an integral part of students’ lives. The text provides an economic framework for exploring the wide array of choices that span a person’s life cycle. The authors’ goal in Principles of Microeconomics: The Way We Live is to help students cultivate an appreciation for and an ability to use their economic “instincts.” Their approach uses common experiences to demonstrate to students that they already engage in economic reasoning. The authors build from the individual to the household to the firm and then to the economy at large.